Long story about today’s post title, however I suppose this is how you feel once the hangover kicks in. I always find that after a night out, with your bed hair, certain outfits look better on. 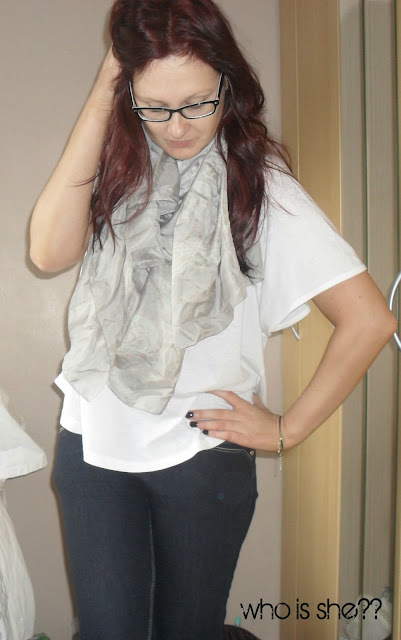 Take the outfit I wore when I made the hangover munchies run to the supermarket- jeans, tee, and a scarf. Nothing particularly exciting, but for me it works. This is what I look like without a scrap of make up on- not a sight you want to see mid morning when you’re doing your weekly shop. Lately my feet have been really hurting from skyscraper heels after a night out, and all what my feet are crying out for is a pair of comfy shoes. As you will know I am having a major Converse love in at the moment and I just had to reach for my new Converse. There’s just something so simple about this outfit and with the added white trainers, I just think it’s the perfect causal outfit. I definitely need to purchase some more converse in different colours- I’m thinking maybe the navy next. I do love my converse hi-tops I wear them pretty much everywhere - I thought they were ruined (after 6 years of faithful service) after a muddy BBQ, but a quick spin in the washer and they were as good as new..whoo hoo! gotta love a pair of Cons, I work for a certain well-known shoe company and we have some wonder woman ones in which I am DESPERATE to buy! I work at head office so it's dangerous for my bank account haha!